Simply order 6 days before and have your goods delivered to your seat for less! Where do I use my Thomas Cook Airlines voucher code? Thomas Cook Airlines is an award-winning British flight provider, with a fleet of almost 100 aircrafts flying to more than 60 destinations around the globe. With flights to some of the world’s best holiday destinations like Crete, New York and Lanzarote as well daily flights to more intrepid destinations such as Goa, Hurghada and Montego Bay, Thomas Cook Airlines allows you flexibility and fantastic holiday opportunities, with the option to fly out to one airport and back from another at various times throughout the day. Whether you’re travelling on a long haul flight to an exotic faraway land, a medium haul flight to a beautiful Spanish resort or a short haul flight to a top European city, you can tailor your air travel to suit your needs and requirements. The Thomas Cook Airlines book and plan section allow you to find a flight, see the timetable, select new routes and see your flight status in a clear and organised way. Here you can also choose any necessary car hire, find value for money travel insurance, sort out airport parking and hotels and find a good rate with Thomas Cook foreign exchange. You can also arrange any pre-ordered meals, if you should require them, and find all the information you need to know about your baggage options. Flight preparation can be stressful if you're not clued up on all the details, thankfully at Thomas Cook Airlines, all the flight preparation you could need is laid out for you so you know exactly what to do. You can find an online check-in under flight preparation; an easy, time-saving option for those who are just taking hand luggage onto your flight. You can also find information on lost or damaged baggage and items that are not permitted in baggage. Here you’ll also find entry regulations such as the API data form (passenger data), special requirements for the USA and additional country border information. Learn all you need to know about classes and fares, onboard services and special assistance on the fly with us section, all the information and inspiration you need to know about possible destinations, hot or cold, with the explore section and how to view your current booking and book additional services with the manage my booking section. In 2016 Thomas Cook Airlines received the award for Europe’s Leading Charter Airline at the World Travel Awards, as well as winning the top spot in the Airline Category of the Customer Service of the Year Awards. All of Thomas Cook Airlines’ routes have comfortable seats, flexible options available on flights and generous baggage allowances, with long-haul flights also providing individual entertainment screens, in-flight meals developed by award-winning celebrity chef James Martin and an increased hand luggage allowance of 10kg. Whether you’re flying economy or premium you can enjoy outstanding service before, during and after your flight with Thomas Cook Airlines, as well as affordable flight fares to all destinations, far or near. If you’re looking to view your current booking, check your flight itinerary, book additional services or submit advance passenger information (API) and secure flight information for your chosen destination, you can do so in the manage my booking section on the Thomas Cook Airlines website. You can also check in online quickly and easily from 24 hours prior to departure on selected departures only, meaning there’s no messing around or queuing once you arrive at the airport. Fill in the required flight details in the boxes provided and get your boarding pass sent to your wallet on your iPhone or print it off at home for an extra piece of mind. Your baggage allowance with Thomas Cook Airlines differs depending on where you’re venturing to. When you travel to the Balearics, Balkans, Bulgaria, Croatia, France, Italy, Spain, Portugal Mainland, the Canary Islands, Cape Verde, Cyprus, Greece, Turkey, Egypt and Gambia a hand baggage allowance of 6kg is included in your fare. Infants under 2 are permitted a 10kg baggage allowance also, on every Thomas Cook Airlines flight. If you’re travelling via economy plus to any of these destinations you can expect 25 kg of baggage allowance and 10kg of hand luggage. If you're flying to Asia, East Africa, the Caribbean, Central America, the Indian Ocean, South America and Southern Africa your baggage allowance is 20kg. For the USA, Canada and Puerto Rico your baggage allowance is 23kg per person. If you are taking Medical supplies with you and need extra baggage allowance this can be added by the airline you are travelling with. Can I take a car seat for my child? Yes, Thomas Cook Airlines will carry a car or booster seat in the hold for free, as long as this is associated with a travelling child. For non-Thomas Cook Airlines flights, please consult your airline directly. Do I need to collect my bags between my connecting flights? If your baggage tag shows your final destination, your bags will be checked through automatically to your next flight. If it doesn't you will need to collect your baggage and check it in as normal for your connecting flight. If I purchase/select seats now, can I change them later? You can change your seat once you have booked and/or selected it, up until 48 hours before your departure time. You can login to your booking through the 'Manage Booking' section on the Thomas Cook Airlines website. If you wish to change a seat, this will show a refund for the first seat, then charge again for the new seat. If you choose a seat of higher value, this will charge the higher price. Please note that seat reservations are 100% non-refundable, should you remove the seat assignment and not select a new seat. 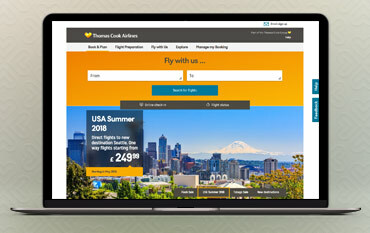 With flights to over 60 worldwide destinations, in 4 different continents from more than 20 UK airports, Thomas Cook Airlines is one of the nations most respected airlines that dedicates its online site to help you find affordable flights. Fly to worldwide destinations such as the Balearic Islands, the Canaries, the Caribbean, Goa, Jamaica, Turkey, the USA, Canada and many more, with an easy booking system, plenty of handy flight extras and extremely affordable and low-cost fares. Book with a Thomas Cook Airlines voucher code from us and enjoy savings on your air travel too, leaving more spends for your accommodation or adventures abroad. We are constantly on the hunt for Voucher Codes for Thomas Cook Airlines to help you with your money saving. Our experts check dozens of sites for secret codes including NHS discounts, student sites & social media channels saving you time & money!